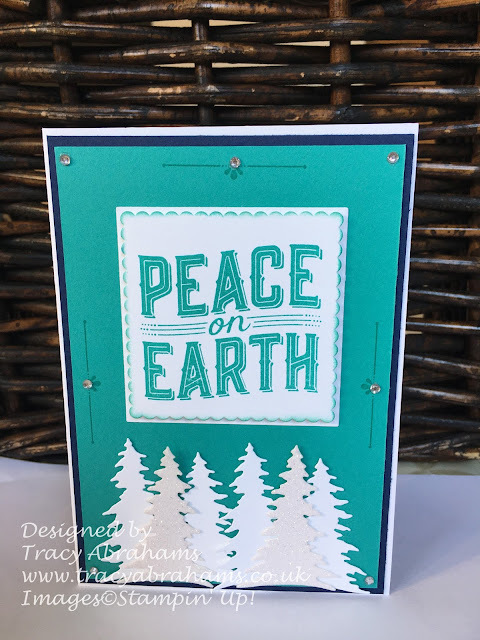 I wanted to share with you another lovely card that I have just made. I loved using the Nailed It Stamp Set for my class last week so I decided to use it again for my Daddy and his Father's Day card. My dad is always in his garage doing something or other and is such a great DIY person that this set was perfect, I think all dads lovely their garages if not to just get away from their kids:) and the wife!!! 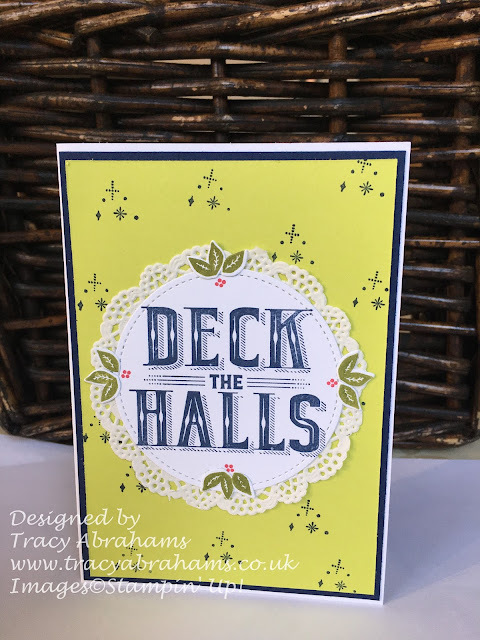 I started by getting a piece of the lovely Cucumber Crush Card Stock and cutting it at 10.5cm down the middle. 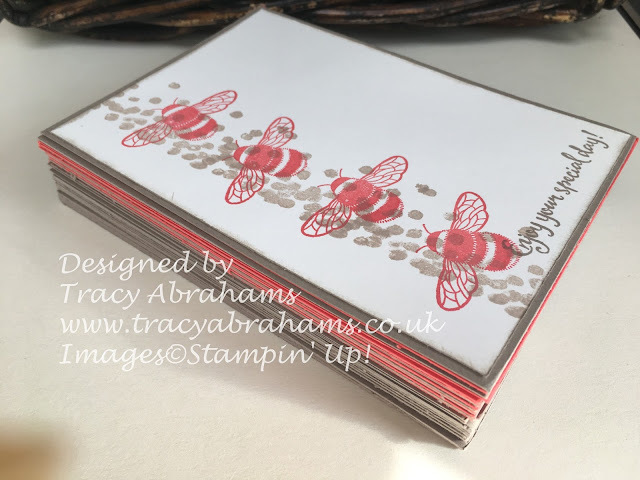 I then folded it in half and scored at 14.9cm I used some of the super cute Urban Underground DSP at the top and I then stamped using Memento Ink, the hammer, Screwdriver and Saw and coloured them in using my Watercolour Pencils and Blender Pen. I love the Watercolour pencils they are so easy to use and I love the result. 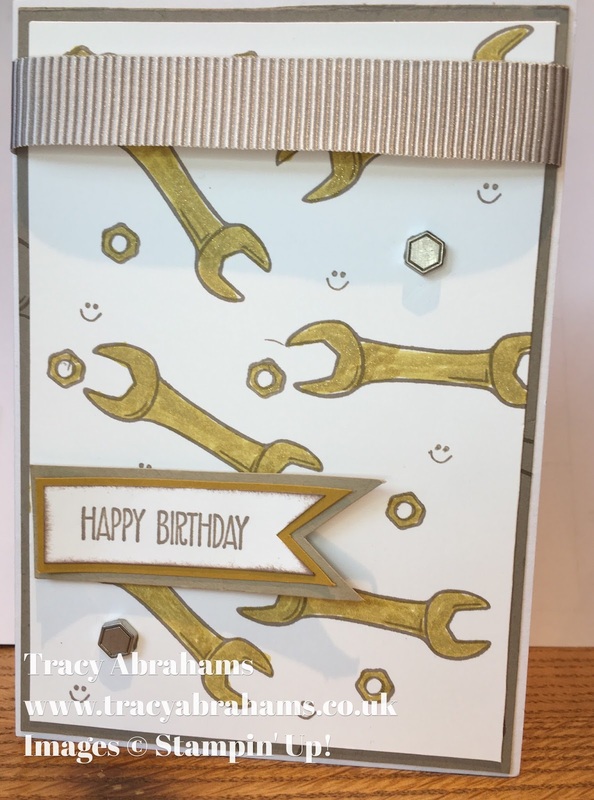 I then fussy cut out the tools which is easy to do and stuck them on the card using some dimensionals. 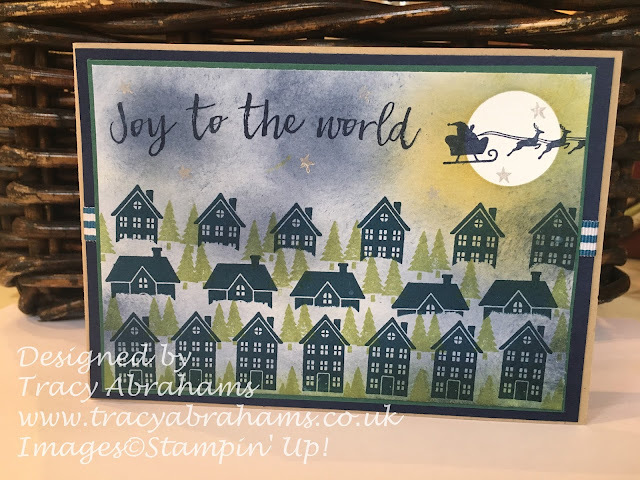 The sentiment is from the same stamp set but I will share a secret I just used the Stampin' Write Maker in Cucumber Crush and just coloured the words in, as i didn't want the lines either side of the words. 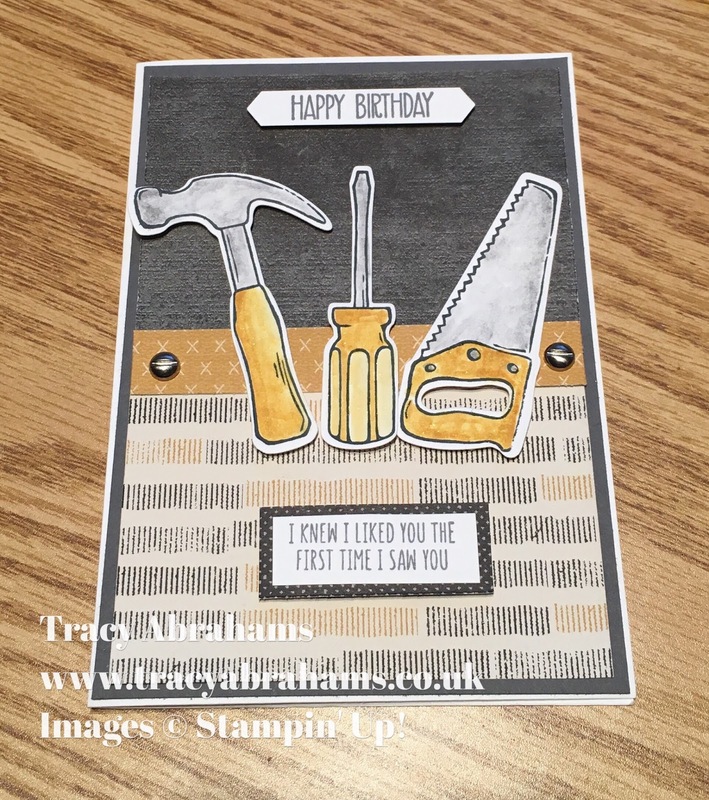 (if you see the stamp set you will see what I mean, hopefully :)) The punch I used is a little sneak peak of a brand new punch called Pretty Label Punch and it's available from the 1st June. 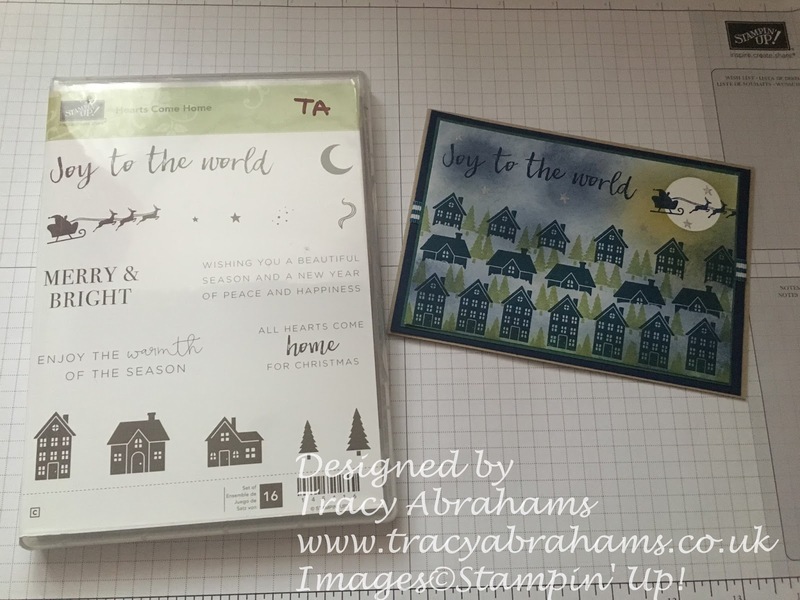 The other little sentiment is from the stamp set also and I used the Banner Triple Punch to cut that out. I loved the way it turned out and it really didn't take long to do. If you like the stamp set why not get one for yourself and make some super men's cards to. You can click on the Picture above and It will take you to my online shop or you can click on the highlighted purple items and this will also take you to my website. 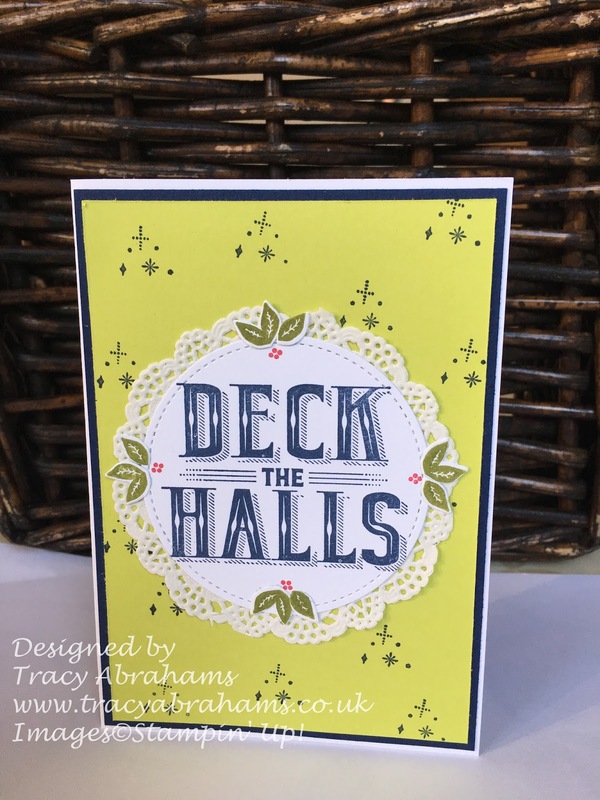 All supplies can be purchase through my online shop and if you use my online Hostess Code ZKZAEPYF I send out a handmade card and Stampin' Up! Free Gift. I'm always happy to help so get in touch if you would like any further help. I just wanted to share with you a fab class i held on Wednesday night using the super cool Nailed It Stamp set by Stampin' Up! This is my new favourite stamp set, well for this week anyway, it makes the cuties men's tools and when you colour them in they come alive. 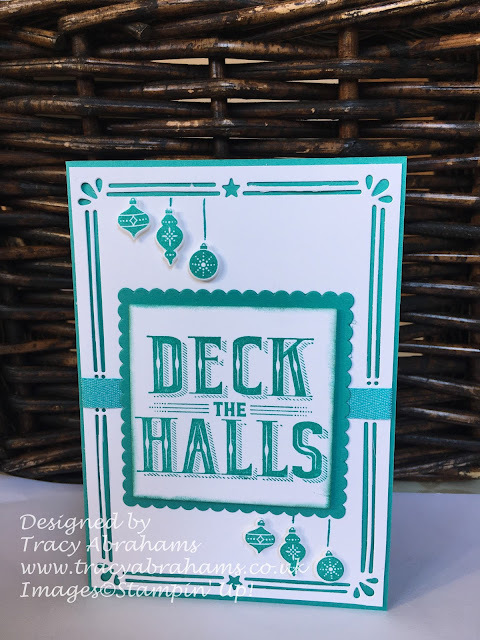 As you can see below we made 3 cards all using the stamp set. 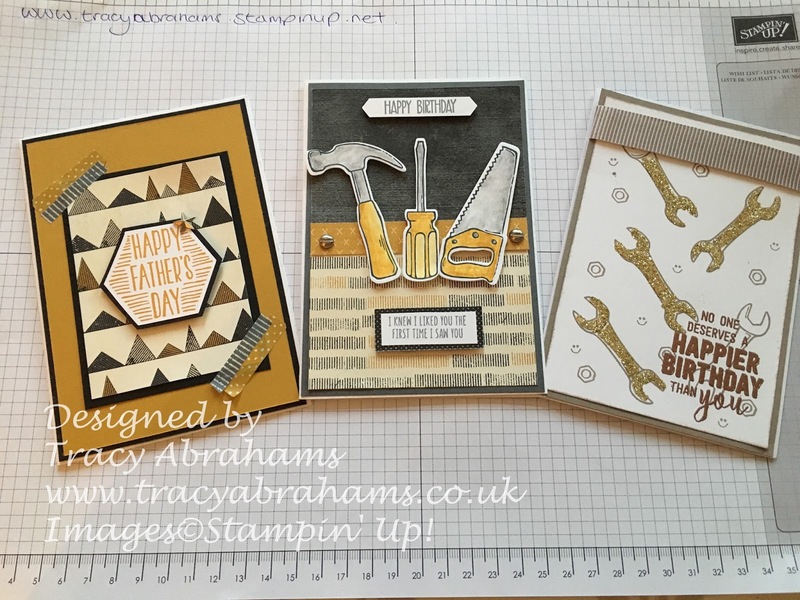 The cards were made to show off how versatile the stamp set is and that you can not only make a fab background like in the spanner card which we heat embossed but with just a little bit of the matching dsp from the Urban Underground suite you can make a Fathers Day card in minutes. and here's all the ladies enjoying the evening. It was such a fun night and everyone went home with 3 men's cards. 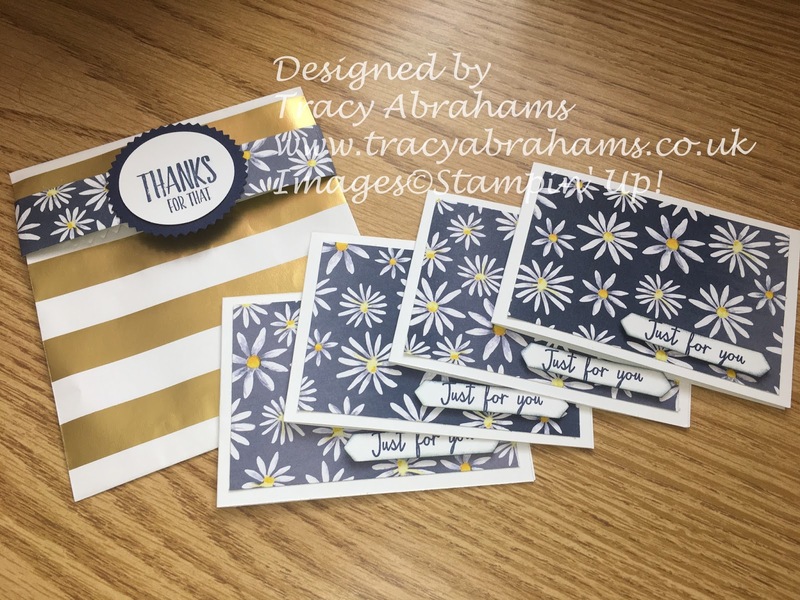 I love sharing my passion for Stampin' Up! 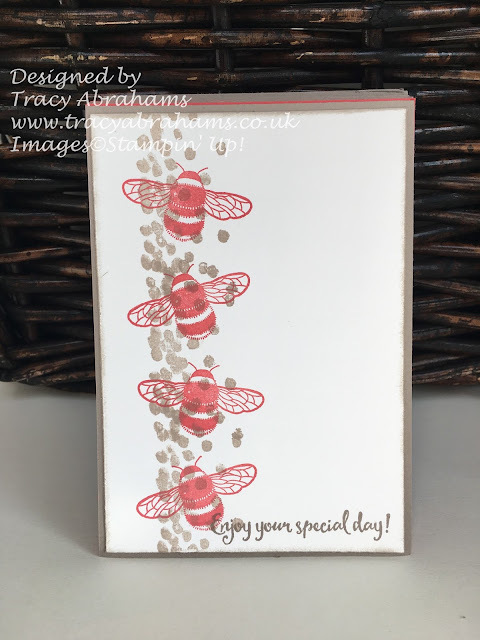 as there stamp sets, framelits and inks always give a great result. If you would like this stamp set or any of the products used in the class please pop along using the highlighted links under the pictures or my sidebar and take a look at my online 24/7 shop. If you do make a purchase please do use my hostess code ZKZAEPYF to get yourself a handmade card and a Free gift from me. The is your reward for shopping with me which i really do appreciate. 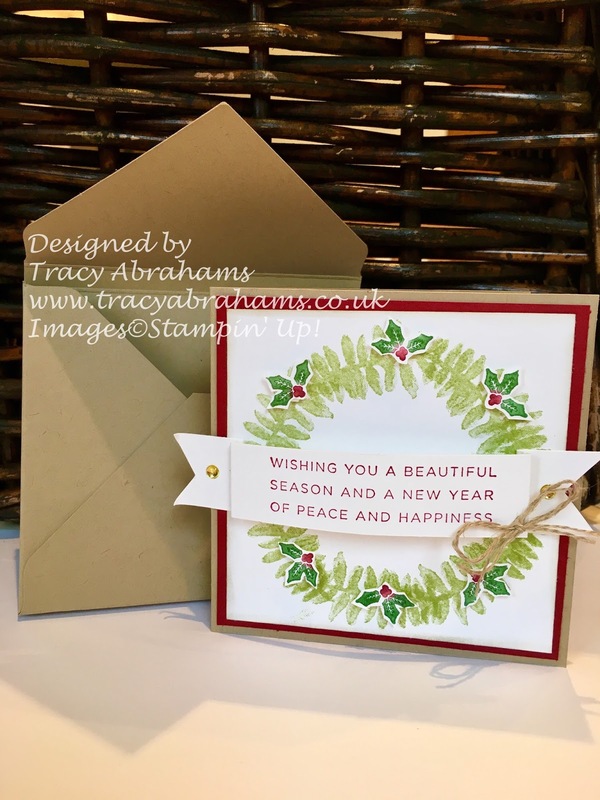 I used some of the lovely FREE Sale-a-bration Glimmer Paper on both of these Baby Cards. On the first card I used my super cute Baby Moon Stamp set, and Blushing Bride Card Stock plus the Stitched Shapes Framelits. 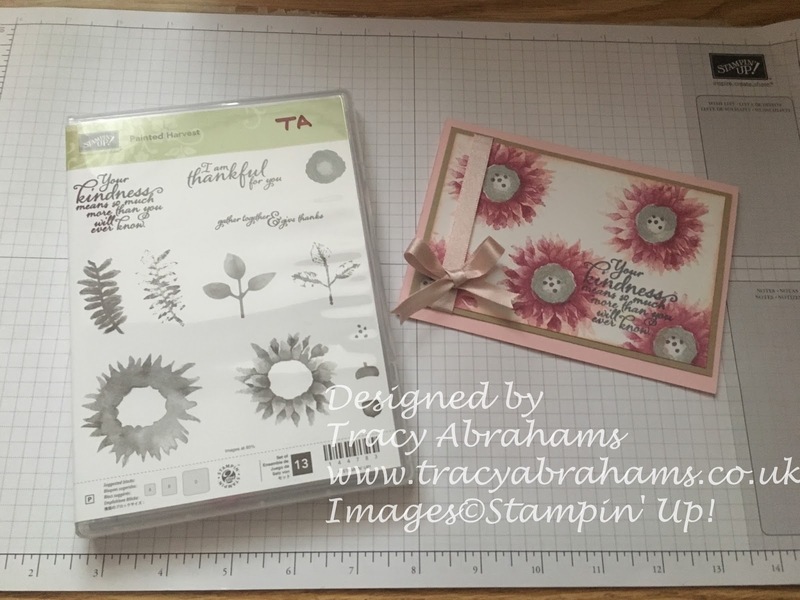 I made a background on the Blushing Bride card stock with one of the stamps from the set and then used the single baby and umbrella image on some Whisper White card stock and mounted that on the card base. I made the little star and the teeny tiny little buttons on the baby grow using my Free Glimmer Paper. I made the second cards also using the Baby Moon Stamp set and coloured the baby in with my blender pens. I love the blender pens they are so easy to use, you just pick up a little of the ink and use the blender pen like a paint brush. 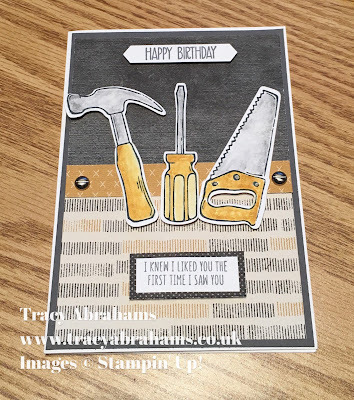 Ohhh and have you spotted the super cute baby sentiment it's from the Milestone Moments Stamp set !!!! 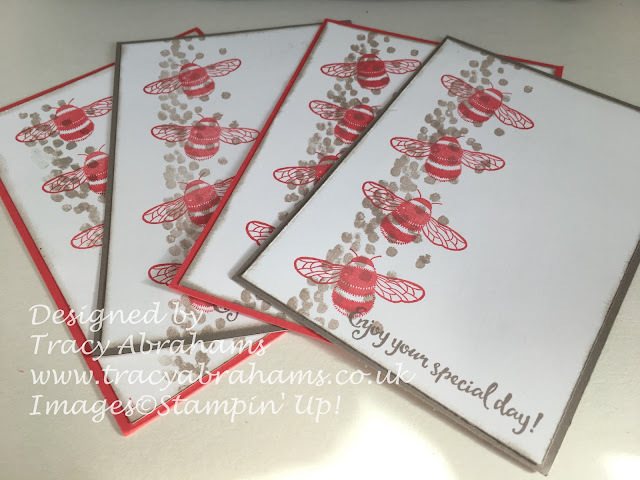 If you like these cards and would like to make some just like these you can get your supplies at my online shop, open 24/7, now is the time to buy your supplies, ink, paper, stamp sets and punches everything as every time you make a £45 purchase you get a FREE product. So if you spend £90 you would get 2 FREE products and so on and so on. 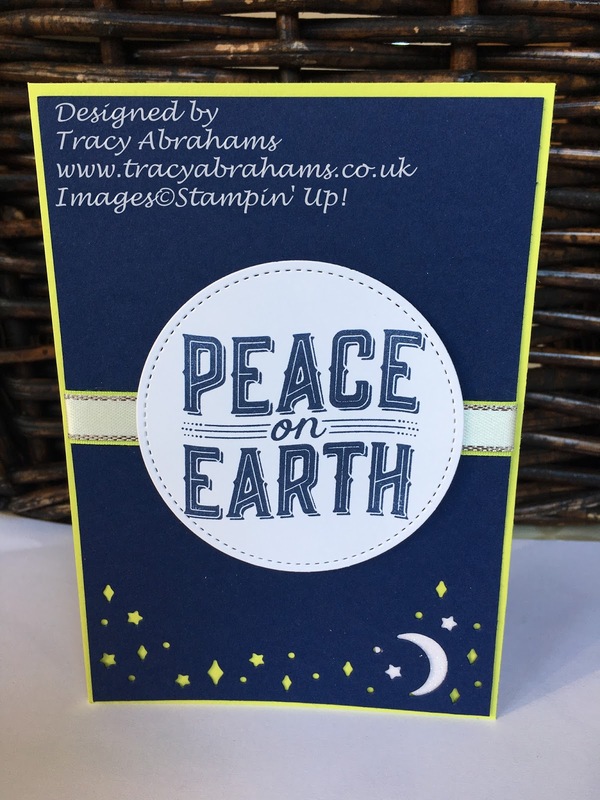 If you place a £200 order you would receive not only your 4 Free Sale-a-bration and there's about 20 to choose from but £20 Stampin Rewards plus an extra £20 Stampin Rewards on top so that would be £40 to spend on anything else in either of the catalogues. Wow what an offer and you have only a few hours and before 10pm 31st March to bag yourself all of these great extras. 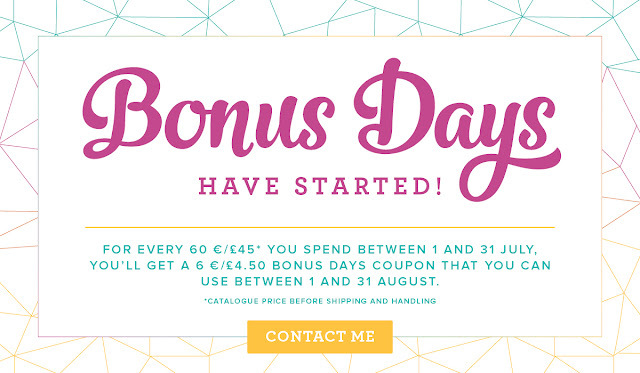 If your order is over £20 and below £150 please use my hostess code RAHMHNZ6 and I will send you out a FREE gift as well (over £150 you receive the hostess rewards yourself under that I share them out between all the orders that month). So be quick and grab all the great extra deals you can.